One of the strangest fish available for the aquarium today is the commonly called “Pearl Fish”. Their scientific names are too many to list but the two main subspecies are Cynolebias bellottii and Cynolebias nigripinnis. The “Pearl Fish” is often grouped in with the Killifish, and their eggs sold on eBay from farms in Thailand. Strange Note: Here is a strange fact, not many species of anything can claim. The “Pearl Fish” exists with very few differences in the species in both South America and Africa. Now, this is not due to it being an invasive species like the Guppy, a fish that hitched a ride during the early days of the hobby and took hold everywhere conditions were favorable. No, the “Pearl Fish” is unique in that it lives its life from birth out of a dry pond bed, flooded by spring rains, grows quickly to maturity, mates, deposits its eggs for the next generation and dies as the pond dries up in the dry season. It does the same in both South America and Africa, and according to Fossil records have done so for over 1,000,000 years. You figure it out! There is a group of extremely colorful small fish from South America and Africa referred to as the annual fish. They inhabit regions in which seasonal droughts dry up many of the ponds. The annual fish live in these temporary ponds and when these ponds dry up, all the annual fish die. That should be the end of the story, a sad ending it would be, but it's not, hence the reason for the name “annual fish”. Through a remarkable life cycle, a new generation is produced each year. In about six month’s time, the annual fish are born, they grow to maturity, and they produce the seeds of the next generation before death by drying overtakes them. From time to time, a half dozen species of annual fish are available to aquarists at least occasionally, but by far the best known are the Argentine pearl fish, Cynolebias bellottii and Cyoebias nigripinnis; these can be used as typical of the group. The male Pearl Fish at its best in breeding condition is a rich navy blue with an indigo tint all over, including its fins. Over the body and fins are rows of white dots that contrast beautifully with the dark blue base coloring. When the male swims, it is reminiscent of a flag fluttering in the breeze, truly one of the most remarkable smaller freshwater aquarium fish you can keep in a community tank. Except for general body shape, the female looks like a different species. Her fins are considerably smaller, and she is an overall dull olive-brown color, with darker brown bars on its body and fins. This coloration is used to hide the female from predator birds that feed in the small pools most live in. The breeding habits of the Pearl Fish in its Argentina native habitat are extremely interesting. When the male and female are ready for spawning, the male will swim back and forth and around the female, meanwhile displaying the most handsome colors that could meet the eye. This fish produces a deep blue at its breeding best that rivals even saltwater reef fish of its size. After a time of showing off his magnificent finnage, he will swim along with his mouth lowered; burrowing or digging up the bottom of the substrate until he discovers what he thinks is a suitable place in which to place the eggs. Note: In nature, this is done in ponds with peat bottoms, you must provide a peat bottom in a breeding tank for 2 reasons. 1) it stimulates and allows breeding ritual to commence and 2) it softens the water. He will then press his body against his mate, sometimes almost wrapping himself around the female (Betta style), as the female follows him and never attempts to escape the embrace. Now he will stand squarely on his head and with his nose bore a fairly deep hole in the peat (so the layer of peat in your breeding tank should be at least 1-inch thick). At this point his mate will come swimming up to him, there is no chasing involved with the Pearl Fish, she will now press her body against his. Then in the midst of a trembling motion, while pressing their bodies against each other, an egg is discharged. This is immediately fertilized by the male. After a few seconds, the egg is placed in the little hole in the substrate that had been prepared by the male fish seconds before. In one or two quick motions the male completely covers the egg with peat, almost like it is planting a seed in the ground. These antics continue over and over in this way for a few hours, perhaps all day long until up to 100 eggs are “planted”. End of Life and the Beginning in Nature: When the ponds dry up in the dry season, the adult pearl fish perish. The eggs sit dormant in the peat of the dried up pond dead throughout the dry season, sometimes up to 6 months or more. As the rains return during the wet season, the Pearl Fish begin their frantic too short lives again without ever seeing their parents or any adult pearl fish. It has been discovered that the eggs of Pearl Fish actually need a period of partial drying. Aquarists have found that if the eggs are kept in a damp soil or moist peat moss for several weeks, the eggs hatch within hours or even minutes after they are returned to the water. Pearl Fish fry has tremendous appetites, and they grow at an unbelievable rate. They must be fed 5-6 times per day for best results, like most egg layer fry, but in even larger quantities. They appear to have a unique rapid time clock that causes them to grow to full maturity in as little as 3 months and be ready to reproduce, since, in some areas where they are native to, the wet season may only be a little over 4 months. How Long Will They Live in Your Aquarium? Unfortunately, nature giveth and nature taketh away. Their time clock works 2 ways, after their breeding season which can last 2 or 3 months, and 2 or 3 spawns, they cannot live beyond their 6-8 month natural lifespan, they become senile, bumping into things, growing humpbacked, shriveled and quickly die within a few weeks. Where Can You Find the Pearl Fish? You can find these unique fish marked on eBay and many places under the name Killifish in many colors. The truth is, Killifish are available in stores and long-lived by comparison. These shipped from Thailand are Pearl Fish usually, but are a fun experiment and will teach you a lot about nature. They collect the eggs in Thailand and place them in damp peat moss. Then place them in sealed airtight containers, finally airmailing them anyplace around the world. These offers are inexpensive and will let you have some fun, but remember they are difficult to keep alive as fry so don’t be disappointed if you fail to raise any to maturity. In the 1950’s, “Annual Fish” gave rise to a commercial venture that was called “Instant Fish”. Eggs of Annual Fish were placed in damp peat moss and sealed in plastic bags. The purchaser was instructed to place the contents of the bags in water and just watch his “Instant Fish” appear. However, the venture was not very successful, because there is a limit to how long the eggs can be stored, and it takes considerable skill to rear the young. 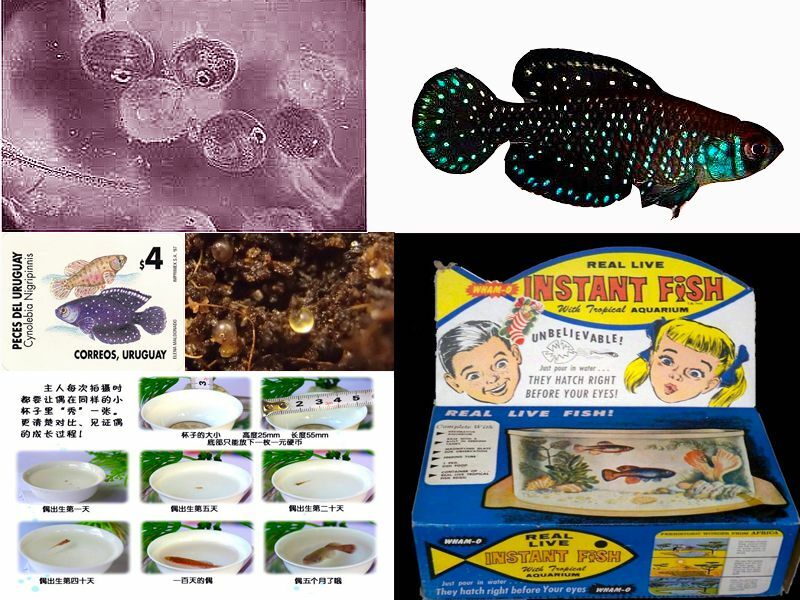 Some of the ads read “pre-historic fish eggs trapped in the soil for millions of years discovered by our scientists, now you can hatch them in your home and watch this long extinct “LIVE fish come to LIFE INSTANTLY.” That sad promotion by marketing opportunists had no instructions or food to keep them alive. Another promotional gimmick of the time promised the “fish would magically appear and grow to full size with our specially prepared superfood” it came with a can of goldfish food. Naturally, they all died in a day or so as well, since the large chunks if food were too large and no attention was paid to water conditions, temperature or the fry’s needs or husbandry. The Pearl Fish or Annual Fish are fascinating to keep, and even more fascinating to breed. The feeling of accomplishment one gets from ordering some peat filled with eggs in the mail and in 3 months of diligent work coming out with full grown beautiful specimens is why we are in the hobby in the first place. As a group, the Pearl Fish are considered by many to be perhaps the prettiest small freshwater fish in the world, and well worth the effort to give this project a try!